Police in the North West could soon use lie detection tests to interrogate suspects. Researchers are in talks with forces in the region to test the technology - the first time it would be available for forces in the UK. The new system looks for involuntary gestures which act as clues as to whether the person being interviewed is telling the truth. The Silent Talker device has been developed in the region and is touted as having a 90% success rate. It uses a video camera linked to an artificial intelligence system that spots small movements people make unconsciously when they lie. 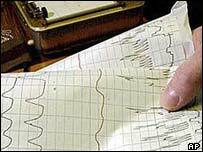 The traditional polygraph test, used in the US, is claimed by some to have a 60% to 70% success rate. But Mark Littlewood, of the human rights organisation Liberty, said the device could infringe people's rights. He added: "The full consent of the suspect should be required. "We are sceptical of its reliability and believe its more widespread use would be a serious and unacceptable erosion of the right to silence." Ian Donald, a psychology professor at Liverpool University, told The Engineer magazine that a great deal of interest had been shown in the project. He said developers were in informal talks with Cheshire, Greater Manchester and Merseyside police forces. Dr Janet Rothwell, psychology researcher at Manchester Metropolitan University, said: "The artificial intelligence system watches for micro-gestures, blushing and head and shoulder movement. "At a basic level it is trained to identify an object, such as an eye. "The next level is to understand if that object is being deformed, for example an eye changing shape." Suspects and their lawyers could still veto the use of the technology during interviews and the law would need to be changed before results could be admissible in court. The Police Information and Technology Organisation said it was monitoring the project. The US government is also believed to be interested in Silent Talker, said The Engineer.